Let’s begin with evaluating each of these tools on certain parameters/criteria that are important for elearning development. These are decisive factors if you plan to deliver your eLearning on mobile devices. Media elements along with the architecture determine the size and performance of any course. Lectora, Captivate, and Articulate Storyline all have different framework architectures for loading navigation and content. Articulate Storyline loads the framework files only once and then loads the content page by page. For heavy media and animation, pre-caching facilitates better performance. Similarly Captivate also loads framework files once and content files page by page. However, unlike articulate storyline it publishes the content as images, thereby increasing the file size and consequently impacting the performance. Lectora reloads framework files as each new page loads, contributing to heavier file size and additional loading time. Also having the framework reloading for each page can also introduce breaks in the visual flow. All three tools come with a toolbox that can help create basic shapes. Along with this, they also have built-in animation presets, which help in creating simple animations easily. Captivate has the largest library with over 50 presets; Lectora has 30+ presets; and Storyline has around 10 presets. Captivate and Storyline also have a timeline feature which makes it easier to create custom animations. Lector does not have a timeline feature. Captivate and Storyline have larger built-in interactive template libraries (20+ templates) as compared to Lectora. Captivate's built-in templates can be customized for text, fonts, and colors; however, their basic functionality cannot be altered. You can also use pluggable interactive widgets developed externally with tools such as Adobe Flash/HTML and then imported into Captivate, which leads to a greater variety of interactivities. Storyline, apart from some built-in templates, also offers the flexibility to create custom templates; you can even save your Storyline project as a template for future use. Lectora has a relatively small in-built template library. However, the tool is flexible and can easily accommodate custom interactivities developed using Lectora or externally in HTML and then integrated into Lectora. As Storyline and Captivate have timelines, syncing of audio and video elements is easier. Lectora, however, has no timeline so one has to achieve synching of audio and video elements using cue points, which is comparatively effort intensive. Articulate Storyline and Lectora support embedding YouTube videos whereas Captivate doesn’t. You can directly publish your course as video for YouTube using Captivate’s unique ‘YouTube ready’ feature. Captivate publishes audio in MP3 format, so if you are targeting the course for Firefox (version < 21), audio will not work. Lower version of Firefox does not support MP3 format so you will have to externally convert the MP3 files into OGG format files and also do some custom coding so that Firefox can detect the OGG format and run the output. Firefox version 21 supports MP3 and MP4 so if that is the target browser, you can skip the OGG format conversion. All these three tools support simulations. Storyline and Captivate both have inbuilt screen capturing features and they support Guided and Practice simulation modes. Lectora does not have an inbuilt feature for simulation. You can capture simulations using external tools like Camtasia/Snagit however this will mean extra costs to acquire those software licenses. Also Camtasia allows for ‘demonstrations’ simulations only and it will not work for any practice simulations you plan to have. Storyline offers a library of around 20 different types of question templates. These include standard assessment templates and surveys. It also offers features such as question pooling, randomization, and the ability to score learner performance at multiple points in a course. Captivate too comes with a library of question templates along with some additional features such as pre-test and branch-aware quizzing, partial and negative scoring, remediation (i.e. based on the score the learner is directed to the relevant section of the content and then asked to reattempt the quiz). Lectora has a smaller question template library with multiple response, hot spot, drag and drop, and other question types. The feedback options are customizable and one can include images and videos to engage learners. In Lectora too, as in Captivate, you can direct learners to specific learning units based on their score. Lectora has an added feature for submitting Test and Survey results to a spreadsheet created in Google Drive. When it comes to customization, Lectora offers very good support for quiz creation. You can have custom interactivities and question templates, as well as define custom variables to track user progress or pass data across templates. All three tools make the entire localization process easy with a good ability to import/incorporate translated XMLSs. Right-to-left languages such as Hebrew, Arabic, and Farsi, are supported in all the three tools. However, note that they're not currently supported in the player elements of Storyline, such as buttons and sidebar menu. Output from all three authoring tools run on Tablets. Articulate Storyline publishes output only for I-pads while Lectora and Captivate support I-pads as well as Android tablets and smart phones. Lectora can also publish output for I-phone. However, these three tools are yet to claim compatibility with Windows or Blackberry Tablet/Phones. It is worth noting that none of these tools are capable of providing responsive/adaptive output. The primary target device is still desktop or tablets. Since the output is in HTML, you can load a scaled version of the output on small devices, however this may impact the user experience. Storyline provides a mobile player for viewing courses offline on iPads. This player also allows you to update and track data from offline usage once you get back online. You just need to ensure that the course is published for Tin Can (and not SCORM/AICC) if you want any offline data tracking. If you are viewing the course in a browser, which necessitates staying online, then publishing for SCORM/AICC works well. Lectora does not have an offline player and neither does it support packaging and delivery of content output as hybrid application. The only option for viewing material published in Lectora on mobile platforms is through a browser while staying online. While Captivate does not have an offline player, it allows you to publish the course as an app to multiple mobile platforms including Windows® RT (Metro apps), using the Adobe PhoneGap™ service (requires separate purchase of PhoneGap). If you do not have an LMS but still need tracking, Captivate could be a good option as it allows custom tracking using Adobe Connect or FTP. With Articulate Storyline or Lectora you will necessarily need an LMS to track user data. Target environment comprises of the Operating System (Windows/ MAC), Browser configuration, and Devices (Tablets, smart phones). So it is critical to understand your target environment and which tools will support it best. Along with that, it is also necessary to understand the available publish options and evaluate them against the required LMS compliance. To help you with this, we have created a detailed comparison sheet. Please click the icon to view the same. All three tools support ADA compliance. 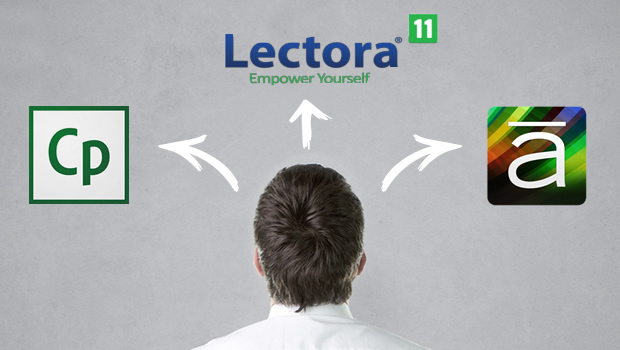 Lectora scores the best of the lot as it publishes fully ADA accessible courses with a single click. It also uses the 508 Compliance Checker to make sure you meet all accessibility guidelines. Lectora allows sharing content on popular social media platforms including Facebook® and Twitter™ using share buttons and other Lectora objects. Captivate 7 uses a Twitter widget that helps learners collaborate with other learners in real time by selecting a specific area within a course and tweeting. Storyline is yet to include any social media features. Each tool offers a variety of features, depending on your requirements, you would need to identify the best fit. Based on our experience, we have tried to rate each of these tools on the parameters mentioned in this blog. We hope the above details will be useful in selecting the right tool. If you wish to share your experiences with these tools, please drop a comment below. Also if you need any more details on these authoring tools, use the comments section below. The Design of Interaction for eLearning | 4th December, 3.30 PM GMT. The Design of Interaction for eLearning | 5th December, 11.00 AM IST. With over 15+ years of experience in the eLearning industry, Sonal heads the content services team of 100+ eLearning specialists at Upside and is responsible for successful execution of all projects and solutions delivered by the team. Sonal builds on her earlier experience of working in different domains including Graphic Design, Instructional Design and Project Management to innovate and create better learning. She has been instrumental in augmenting Upside's portfolio by introducing innovative solutions and services. Sonal holds a Post Graduate Diploma in Business Administration from Symbiosis, a Post Graduate diploma in Journalism & Mass Communication from Symbiosis, a Dual Diploma in Web Engineering from Arena Multimedia, and a Bachelor's degree in Physics specialising in Photography & Mass Communication from Fergusson College in Pune, India. Thanks Sonal for the great comparison of these tools! I put this out on my blog, pointing people to this posting. At Calvin College, we are mainly using Captivate — but not to the extent that you all are using the tool. We use Captivate in more of a Explain Everything sort of way (or tool) or a Blackboard Collaborate tool with the application sharing and recording features turned on. That way, video/audio and desktop screen sharing are being recorded in addition to any hand raisings, comments in the chat area, emoticon-based feedback, etc. So while you all are doing much more interactivity, we are mainly using the desktop screen recording type of features. So I can't comment on a lot here — but mainly, just wanted to say thanks for the work you all are doing! Thank You So Very Much Sonal, You knowledge and wisdom is highly appreciated. It is really worth reading your post. The comaprison really help us to choose right authoring tool to deliver the Best e-Learning Solutions to Clients. Thank you for this comparison. I have used many different authoring systems over the years (going back to Teacher's Aide, Plato, TenCORE, IBM Storyboard Live!, Quest, Authorware, Director, Sage, Lectora, Articulate, Storyline, SimArete, ToolBook and Captivate) and as technology "advances" we always find ourselves stepping back due to incompatibilities and system/code limitations. My latest projects find me using Captivate and being limited to how much animation I can use that is also HTML5 compatible. Don't even try to use Flash on the mobile delivery platforms…. but I recently was introduced to a software browser that you download through iTunes called Puffin from CloudMosa, Inc. This browser costs $2.99 and enables Flash-based content to run on the iPad and iPhone. If you can convince your clients to adopt (yet another) web browser, this is the ticket. I wonder if they are selling stock before Adobe snatches them up? Thank you for your hard work and insight. Most of our government clients require us to be looking forward to the refresh which will more closely align with WCAG 2.0 Level AA and so we will continue to develop directly in html for true accessibility (particularly with the mobile device capability necessity these days) until I see a big change. We only use any of these if we need easy output for SCORM and even then we tend to look for SCORM programmers to write for our html code. Any new thoughts with the arrival of Captivate 8? Where do you think HTML5 animation is best supported? Thank you for this comparison! Actually I'd also suggest that you try iSpring. It does support various mobile platforms including iPads, iPhones, Android and Windows tablets and smartphones! Thank you for the post. Do they Captivate features become more functional with the introduction of Captivate 8?